"This is a recipe handed down by my mother and is a local favorite back in West Virginia, up in the Appalachian Mountains. This recipe consists of picking the largest dandelion flowers and leaving the entire stem behind, battering the flowers up and frying them in butter. Has a flavor similar to that of mushrooms. One word of caution...to avoid a bitter taste, make sure the dandelion flowers you're picking have not been sprayed by dogs or pesticides." Combine the flour, seasoned salt, and pepper in a mixing bowl until evenly combined; set aside. Beat the eggs in a mixing bowl, then stir in the dandelion blossoms until completely coated. Melt the butter in a large skillet over medium heat. Remove half of the dandelions from the egg, and allow the excess egg to drip away. Toss in the flour until completely coated, then remove from the flour, tossing between your hands to allow excess flour to fall away. Cook the dandelions in the melted butter until golden brown, stirring occasionally, about 5 minutes. Drain on a paper towel-lined plate. Repeat with the remaining dandelions. 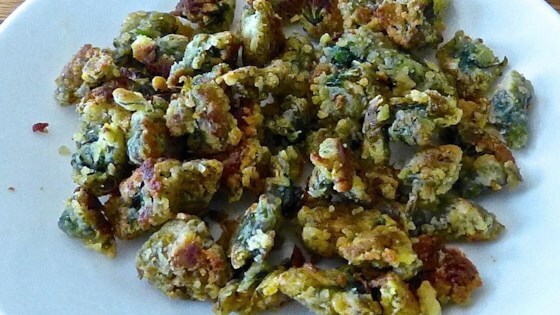 See how to make crispy fried okra. Prepare the dandelion flowers ahead of time by submerging them in a bowl of room-temperature water with about 1 tablespoon of salt added to the water. This rids the flowers of any insects that could be in the blossoms. Soak for about 10 minutes. Rinse the flowers in fresh water. Using a salad spinner works nicely to rinse and dry the dandelion flowers. There is a variety of the dandelion that has a thin solid stalk and this is NOT the flower to use. Make sure the dandelions you pick have the tubular stalk. As an option, canola or vegetable oil can be used to fry the dandelions in but the flavor will change accordingly. Try using some other spices, like garlic powder, in seasoning to taste. My grandma made Fried Dandelions when I was young and they were always so delicious. Thanks for this recipe! Just like grandmas! Really good! Next time I make this, I'll only use half as much flour/salt/pepper, however. This is pretty good. I also battered the opened yellow flowers this way, and the tiny, unopened buds found at the middle of the plant. Easy and delicious! I've been wanting to do something with all the dandelions in the yard. I will be making this again!